or simply given right of way because it was there first. This respect for the past is because modern Rome knows that the dirt and stones they walk on are the embodiment of tradition and family. as a subterranean window boxes in a Metropolitana station. 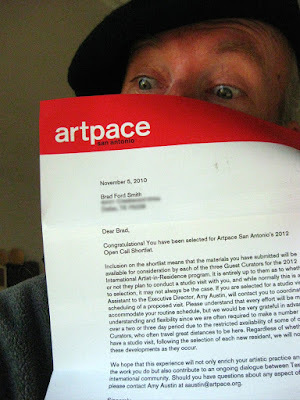 I received this letter from Artpace just before we left for Rome, and then it got berried in the accumulated pile of vacation mail so I am a bit late opening it up. It says I have been Shortlisted for the Artpace Artist in Residence Program in San Antonio. And that there is a possibility that the Guest Curators will request a studio visit in the near future. So, I should clean the studio, or keep it the rat nest that it has become. On another note, the Texas Biennial turned down my application with a We Regret to Inform You e-mail. It would have been really cool to be a part of that event... I'll just add it to my stack of rejection notices from other organizations such as TEDxSMU, The Lawndale Art Center, The Drawing Center, The Idea Fund, Henderson Art Project, and don't forget the Texas Biennial 2007 and 2009, and Artpace 2007 and 2008. Of coarse I have been accepted into several great art programs and art shows. I ramble on and on about each of them here on my blog. And don't think I am belly aching about getting rejection notices. It's all part of expanding beyond the studio walls. To be turned down by some of these organizations is something I sometimes wish I could put on my resume. Wow, Mr. Smith, the quality of your rejections indicates that you would be an excellent candidate for our multi million dollar artist grant! I get the feeling that every trip to Rome could result in the creation of a travel book on art, history, and food. I know I filled up a moleskin with drawings and notes. Brought home a few pounds of post cards and magazines. And I still haven't finished sorting out the hundreds of photos. So to help me get a handle on some of this information I'll be posting some thoughts and photos over the next few days on things that stand out for no obvious reason. These photos are from the Capitoline Museum. The first 2 are marble fragments from the colossal sculpture of Emperor Constantine the 2nd. I've wanted to see these detached body parts since I was a little kid. Next is a giant bronze hand, also of Mr. Constantine. These are just some of the large sculpture fragments I saw scattered across Rome. It just goes to show, if you make it really big and flashy, future generations may only remember you by the sized of your toenails. I recieved the CAC catalogue in the mail today, and there, in black and white is the listing for the sculpture class that I will this teaching in January. It's a figurative sculpture class that works from a live model. It's just like a figure drawing class, but I think that working in clay from a model is much easier than drawing. For one thing you aren't started off with that old tired mind set "I can't even draw a straight line". You also don't have to learn how to translate a 3 dimensional world into 2 dimensional pencil marks. All you do is make this round piece of clay look like that round piece of person. That is of course an over simplification for demonstration prepossess. Anyway, as you can guess, if the class makes, I'll be blogging about sculpture a lot in the next few months. The name of the class is The Expressive Figure in Clay, and you can click HERE for more info on the class.